Affiliations: The City-Keepers are allies of the Kree, while the Demon Rebels are enemies with them. They live in mobile cities shaped like immense beetles or spiders. The ruling class, the City-Keepers (also known as the City Mongers), live in the "body" of the beetle, while the lower classes, the Squalor Dwellers, are forced to live in relative squalor in the "limbs" of the beetles. Opposing this class system and way of life, are the Demon Rebels. They are anarchists, who live in giant robot spiders, with no divisions between classes. The City Keepers and Demon Rebels will use their vessels to actively combat each other, even at the expense of crippling each other. The Squalor Dwellers, while forced to live under the City-Keepers' rule, are more closely allied with the outside Demon Rebels. Skin Color: Yellow ........ Average Height: 5' 10"
Powers/Abilities: None. The majority of Stent is a desert environment, composed of a thin pink dust, upon which it is virtually impossible to move without sinking. 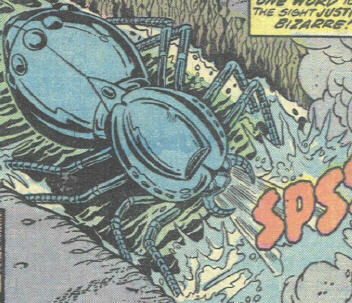 The Stenth use their giant robot beetles/spiders to travel. A more comfortable environment is maintained in the vessels. The vessels carve a pathway through the sandy surface using sprays of water, which is stored in the vessels' "bellies." They continually make paths in search of more water, which they use to make more paths, for more water, etc. The Stenth vessels can also be used as weapons, fire explosives and energy beams, and even to physically attack a foe. They also have relatively primitive starships. Stenth soldiers are armed with jet packs and stun guns. The Demon Rebels had a device which could read brainwaves and determine if one was telling the truth. History: The Stenth developed in the fashion described above under traits and abilities. (Inhumans I#7) - The City-Keepers, under Flarn, encountered the Inhuman Family. Apparently assuming them to be allies of the Demon Rebels, they shot their space ark out of orbit and captured them after they crashed. After learning his mistake, Flarn granted them their freedom, but just then Shreel and his Assault Force (Squalor Dwellers) arrived and attacked the City Keeper council. The two groups fought, heedless of the confused Inhumans. Shreel cautioned the City-Keepers against firing on his sector, as he had planted a bomb there. The City-Keepers attempted to call his bluff, and fired on he and his sector--but he was not bluffing. The bomb blew off one of the legs of Flarn's beetle, killing Shreel and the Squalor Dwellers living in that sector. The beetle was then partially crippled, and began traveling in a circle, as the City-Keepers continued their obsessive water search. (Inhumans I#8) - The Inhumans appealed to Skornn, the head of the City-Keepers for aid in repairing their ship. Skornn refused, saying he needed all available resources to repair their own beetle-vessel, but did allow Black Bolt and Medusa to take jet packs to return to their crippled ark. There they were attacked by Warkon's Demon Rebels. Shribe recognized Falzon as a Kree (enemy to the Demon-Rebels) and the others as originating from mutant strains of Kree oriented genes, and so marked them all for execution. Medusa convinced Warkon that they were enemies of the Kree as well, and so he released them. He allowed Black Bolt and Medusa to return to Skornn's beetle to collect their allies before the fighting reached its peak, although the two groups engaged each other almost instantly. The Inhumans managed to regroup and returned to Warkon's spider-vessel, just as Skornn conceded defeat. However, the only problem was that both vessels (beetle and spider) had been crippled as they grappled with each other, and neither vessel would be able to make it another water hole. (Inhumans I#10) - Warkon, the Demon Rebels, and the Inhumans overtook Skornn's beetle-vessel, having to overcome the City-Keepers' soldiers. Skornn pretended that it was a group of renegades who had attempted to drive them off. Warkon forced Skornn to allow them access to their emergency silo to use the spacecraft to escape Stent. Black Bolt stopped Warkon and his men from killing Skornn and his allies. However, after they took off, they learned that Skornn had anticipated their actions and had pre-programmed the ship and locked its controls so that they were sent to a Kree outpost, led by Mon-Tog. Knowing they were vastly outnumbered at the outpost, Warkon led his allies and the Inhumans to pose as the City-Keepers. The ruse worked initially, until Skornn contacted the outpost and revealed their deception. As the last of his Demon Rebels were destroyed, Warkon managed to get the Inhumans into the escape craft and launch them to safety, as he sacrificed himself to blow up the Kree outpost. Comments: Created by Doug Moench and Gil Kane. The top image and some of the biographical data was taken from the OHotMU Deluxe Edition#15: Appendix to Alien Races. Only a few populations of the Stenth have been seen, so the information given may not be representative for the whole population, although the information in the OHotMU (and some comments from the Kree and Warkon) would make it appear to be that way. The Stenth had speech balloons that, at least at the time (1970s-1980s), were usually used to symbolized telepathic communication ( little " symbols dispersed around the circumference of the balloon). It may have meant something else, such as perhaps a translator being used. On a single instance, where one of the City-Keepers spoke to the Squalor Dwellers, there was a note that there was "telepathic translation of the City-Keeper's amplified voice." Telepathy is not mentioned in their OHotMU profile, so it's unclear how this occurred. Flarn and Skornn may well have been one and the same guy. They wore different costumes, but were both bald, and when the Inhumans spoke with Skornn in Inhumans#8, they acted as if he were the one they dealt with in Inhumans#7. However, they do look a little different, and I tend to think that Skornn led the council of City Keepers, while Flarn was perhaps just a member or the spokesperson to the Inhumans initially. Maybe they were brothers? The Marvel Comics Index #8B: Iron Man and others lists Skornn as appearing, but there is no mention of Flarn...Ah, who cares anyway. Go read it yourself. Inhumans#9, despite the cover, reprints the Inhumans stories from Amazing Adventures II#1 and #2. There is no new information whatsoever. The cover, which is at least a nice picture, also misnames the Kree leader from the next issue as Mor-Tog, when it should be Mon-Tog. hmmm...perhaps they might by loosely affiliated with the Cockroach Conspiracy? One of the heads of the City-Keepers and apparently served in a council alongside Skornn. 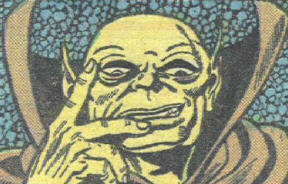 He was involved in the capture of the Inhumans and the bombing of Shreel's Squalor Dwellers, which blew one of the legs off of their beetle-vessel. The commander of the squadron of City-Keeper soldiers was killed during that struggle--this may or may not have been Flarn. see also the comments. A Squalor Dweller. He led a rebellion against the City-Keepers in Flarn's beetle, but was killed when they fired on his sector, in which he had hidden a bomb. Warkon referred to him as a brother, but this may well have meant as a brother-in-arms. A Demon Rebel. 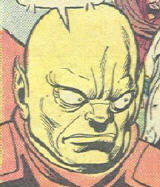 He served as apparent second-in-command or advisor to Warkon. He was quick to condemn the Inhumans as enemies. He was the apparent leader of the City-Keepers. He was involved with the decision to shoot down the Inhumans, as well as to fire on Shreel's sector, which crippled their beetle-vessel. He reneged on the council's vow to help the Inhumans rebuild their ark, and his vessel was subsequently overcome by Warkon's Demon Rebels. He sent one last squadron of troops, which were also defeated by Warkon and the Inhumans, and then pleaded for mercy, claiming the troops to have been renegades. 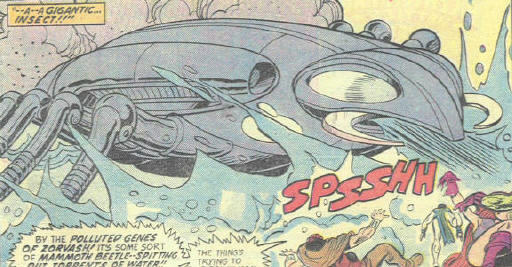 He was forced by Warkon to allow him to take his ship off of Stent, but had secretly anticipated this and pre-programmed the ship to take them to the Kree outpost in hopes that they would be destroyed. He also contacted the outpost and revealed the true nature of the Demon Rebels, who attempted to avoid death by posing as City-Keepers to the Kree. 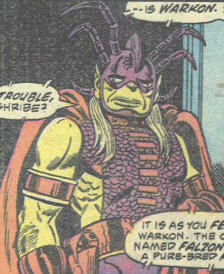 note to comic book characters: Don't trust people whose names are similar to "scorn." Leader of the Demon Rebels. He spared the Inhumans, but then attacked the City-Keepers' beetle vessel as they were trying to rescue their remaining members. Following the City-Keepers' defeat, and the crippling of both vessels, he led the Inhumans off of Stent in Skornn's ship. 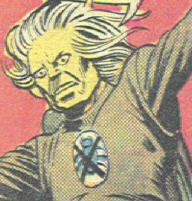 However, he fell into Skornn's trap, as the ship was pre-programmed to take him to the nearby Kree outpost. 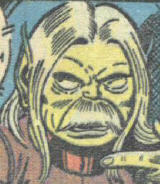 Warkon attempted to escape death at the hands of the outpost leader, Mon-Tog, by posing as City-Keepers, who were allies of the Kree. However, Skornn notified Mon-Tog of their deception. Warkon's men were all killed in battle with the Kree, and Warkon sacrificed himself to blow up the outpost, after helping the Inhumans to safety.